Dentist Roswell: How Much Do Dental X-rays Cost? A single dental x-ray would cost between $28-38. Four check-up or bitewing x-rays may cost between $60-80, and a full mouth series (18 x-rays) or panoramic x-ray would cost between $100-200. If it’s a new practice or mature one that is trying to build or rebuild its patient base, often the x-rays will bundled with an examination that ends up costing the patient virtually nothing. Most dental insurance covers x-rays at 100%. It is usually considered a diagnostic or preventive service. If you are a new patient, the dentist should recommend x-rays to determine the present status of your oral health and to help identify changes that may occur later. They give your dentist a baseline of your present condition. A new set of x-rays may be needed to help your dentist detect any new cavities, determine the status of your gum health or evaluate the growth and development of your teeth. If a previous dentist has any radiographs of you, your new dentist may ask you for copies of them. We take four bitewings (which show us in between the back teeth to check for cavities). Sometimes we take a full series of images (18 images or so…which show us cavities plus also shows us bone levels and nerve health). A panoramic image is a single image of the entire upper and lower arch. This requires a different machine and can cost $125-175 or more. It shows the entire mouth on one image. Many diseases of the oral cavity (which includes the teeth and surrounding tissues and bone) cannot be seen when the dentist examines your mouth. Dental x-rays are used to diagnose or detect tooth decay, impacted teeth, jaw problems, abscessed (infected) teeth, or current filling placement. 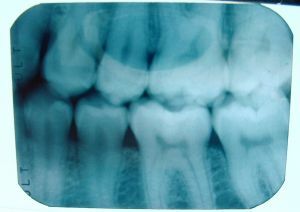 An x-ray exam can help your dentist see the small areas of decay between the teeth and fillings; bone damage from a tooth infection or cyst; bone loss due to periodontal (gum) disease; developmental defects; some types of tumors; the effects of trauma; and the position on unerupted teeth in children and adults. Dental x-rays can also reveal bone loss from periodontal (gum) disease, locate tarter build-up, find foreign bodies within the gum or bone, and see if there is enough bone for the placement of dental implants. Finding and treating dental problems at an early stage can save time, money and unneeded discomfort and help prevent more serious health problems. A good dentist will tailor a treatment plan to your finances, altering the ideal treatment as much as possible to help you be able to afford it. If we can be of help, please do hesitate to call, email or make an appointment to be seen. Dentist serving Roswell, GA – Dr. Novy Scheinfeld, one of the leading Atlanta area dentists, was recently recognized by The Consumer Research Council of America as one of ‘America’s Top Dentist’ for 2011. Located in Washington, D.C., The Consumer’s Research Council of America is a health care advocacy organization that strives to assist customers in getting the highest quality professional health services through extensive independent analysis. When selecting ‘America’s Top Dentist’ recipients, the Council uses a point system that takes into consideration a dentist’s comprehensive experience, continuing education, professional association affiliation and professional training.